I love this verse! There are times when I wonder if I am making any gains in my spiritual life. Too many times I start the new year with well-meaning goals and resolutions. Not that they can’t be attained, but on my own, my best efforts usually hit a wall at some point. But thankfully, when God starts a project, He finishes it! Paul is describing the Christian’s growth process here. God’s work for us began when Christ took our place with His sacrificial death on the cross. His work in us begins when we first believe. With Jesus Christ as our foundation, He continues framing and building our character while daily enabling us to be more Christ-like through His indwelling, empowering Holy Spirit. 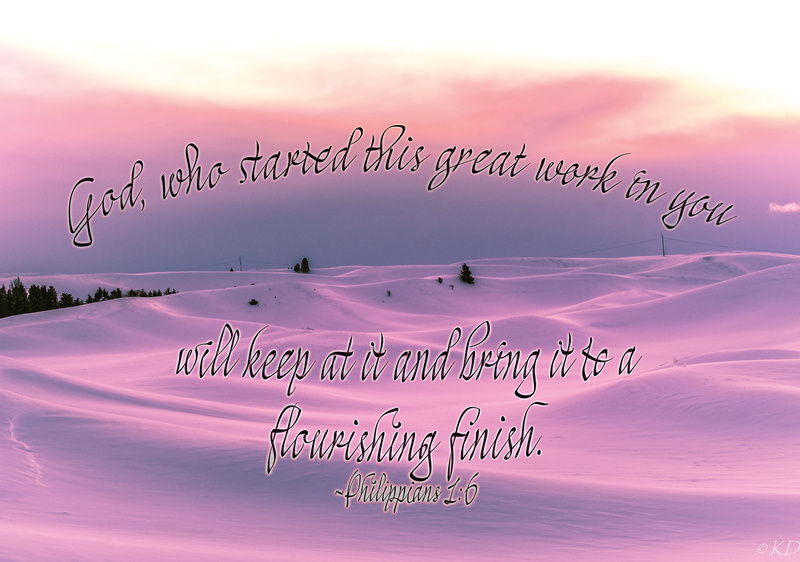 If you are God’s child, rest in the promise that He will finish this good work when we meet Him face to face. This entry was tagged Christianity, God Finishes What He Starts (Philippians 1:6), how can I be more Christlike?, how does God grow us as Christians?, spiritual growth, trusting God to grow us into Christlike character, what is the Christian's growth process?, When does God's work for us begin?, When does God's work in us begin?, when New Year's resolutions fall apart. Bookmark the permalink.